Tropical Storm Erika: Havoc in the Caribbean, Florida flood threat. 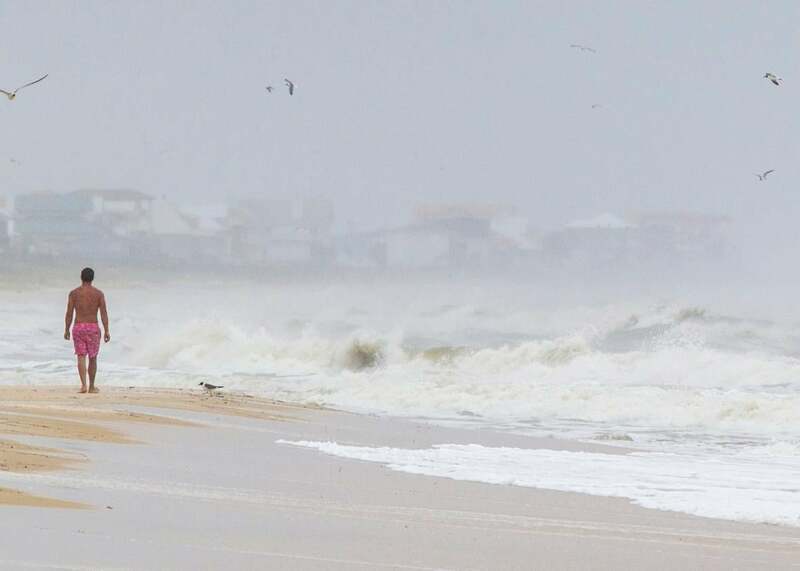 A man walks on the beach in the heavy rain and surf on June 6, 2013 in St. George Island, Florida, prior to Tropical Storm Andrea, the last tropical storm to affect Florida. With a murky forecast looming, Tropical Storm Erika continues to cause headaches for meteorologists and those in its path. On Friday morning, Florida Gov. Rick Scott declared a state of emergency and activated the state’s National Guard as Erika slowly made its way through the Caribbean toward the United States mainland. Over the last 10 years, Florida hasn’t had a single hurricane landfall, an unusual stretch of slow activity. The latest official forecast from the National Hurricane Center looks to continue that streak. Friday’s NHC outlook no longer calls for a hurricane strength landfall in Florida, and instead predicts that Erika will dawdle over Florida for two or three days, boosting the potential for copious rainfall. Parts of South Florida are currently in extreme drought, though the current forecast is likely to bring flooding to many spots. But first, Erika still poses a threat to the Caribbean. On Friday, heavy rain will continue affecting the islands, with Haiti and the Dominican Republic likely to feel the strongest impact. This is a part of the world where it doesn’t take an extremely intense storm to cause real damage. As Erika passed through the eastern Caribbean on Thursday morning, the storm dropped more than a foot of rain on the island of Dominica in just 12 hours, leading to intense flash flooding. A government official from Dominica told a news station in Trinidad and Tobago that 25 people had died in one community alone, and that the island’s main airport had been “totally devastated.” He also said floodwaters reached 4-5 feet high in the capital, creating harrowing scenes. In 2004, Tropical Storm Jeanne left more than 2,500 people dead in Haiti—likely the deadliest tropical storm landfall ever to occur in the Atlantic. In 2008, a series of two tropical storms and two hurricanes in quick succession killed hundreds more. On Thursday, Haiti activated its national emergency plan in advance of Erika. The National Hurricane Center expects 3 to 10 inches of rainfall there by Saturday. Forecasters trying to anticipate the storm’s path and strength beyond Saturday have been thwarted by a chaotic spread in weather model output for days. Over the last 24 hours, weather models have gradually shifted from a potential hurricane off Florida’s East Coast strengthening toward the Carolinas and perhaps the Mid-Atlantic, to a somewhat weaker storm squarely aimed at southern Florida. The outlook for Florida will remain opaque until the center of Erika re-emerges on the north side of Haiti, likely sometime on Saturday. At that point, the storm will have about 36 hours to intensify over the warmer-than-normal water of the Bahamas before its likely landfall in Florida. That’s plenty of time for a hurricane to form, as had been indicated for the past few days, although no major model is showing that scenario at the moment.